I'm trying this guy out with Naomi O'Bannion, Peter Clover, Isaac Miles, and City Map. The latter three cards make the Gambler OK. His ability is still expensive, but he's still nice in retrieving a lost card that I want back. What I'm really excited about is using Naomi to trigger a Tactic, using the Gambler to intentionally "guess" wrong about the Tactic that Naomi just put on the bottom of my deck, and then using Naomi to trigger the same Tactic again. This might occur over the span of my turn and my opponent's turn, but I still like how Naomi wins when the Gambler loses. I like the idea of using him with fated cards to get them back into your hand. Smugglers is certainly far better at what Degenerate Gambler tries to do. I like the Gambler better. There is no guesswork with the Smugglers, but it's too expensive. If Smugglers didn't cost 3, didn't require exhaustion, or didn't require paying 1, I might agree that it's better. 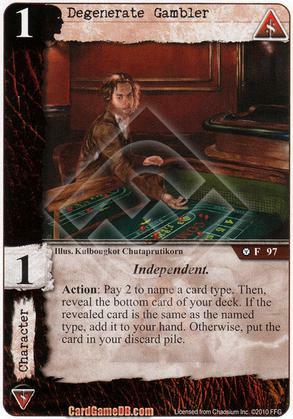 But the Gambler is super-easy to play while still giving you the same potential benefit. And his unique synergy with Naomi is just icing on top. Note that I'd only use the Gambler's ability if I know what the bottom card is (unless I have Naomi out). Well, the cost for Smugglers covers more than their ability.